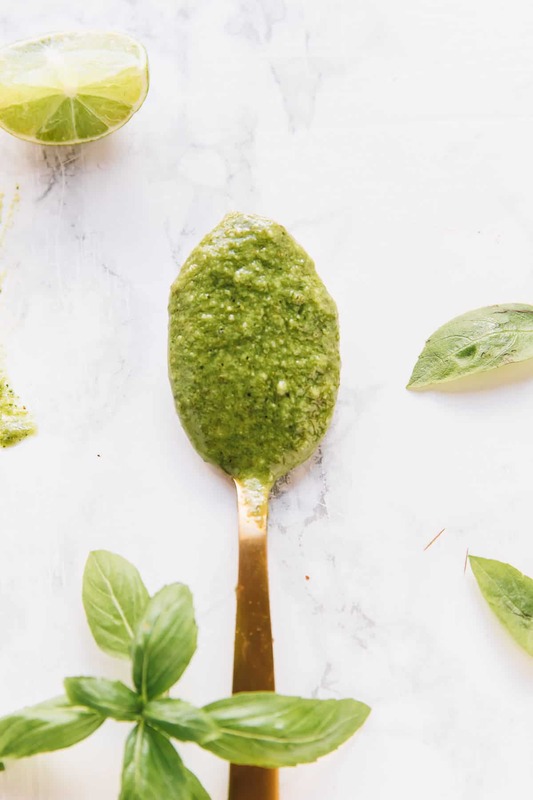 This Easy 10-Minute Basil Pesto recipe is packed with lots of flavour, and is perfect for a dip, your pasta or on anything! It’s made with only 7 ingredients! Hey friends, plant mommy Jessica here, ready to brag about her plant baby aka my Genovese basil plant. 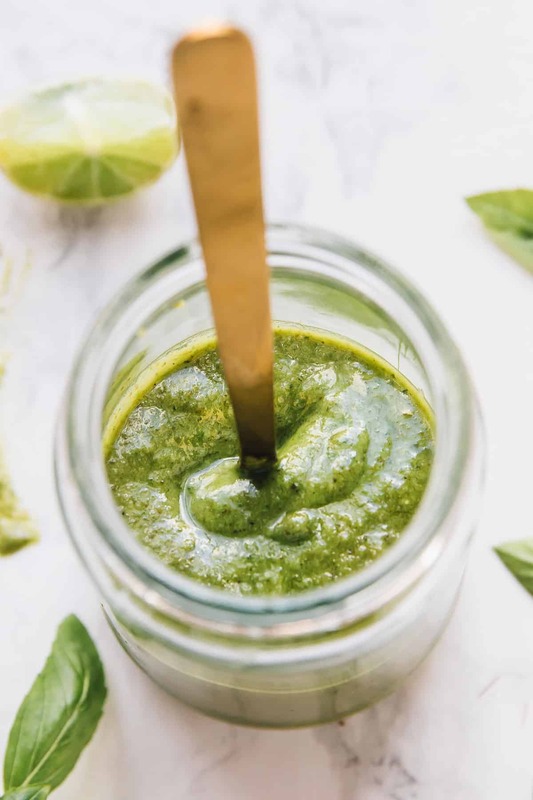 It has been producing tons of delicious basil for me and after realising that I needed to prune it, I realised that I have never made a basil pesto recipe for you! Crazy, right? So several cups of basil later, I have a delicious, flavour packed and super easy basil pesto recipe for you. You’re going to want to make this as soon as possible and then put it on everything. This isn’t my first time making homemade pesto. Kale pesto, cashew pea pesto (YUM!) and parsley pesto are just a few of my favourite pesto ways. Even though I’ve always loved more unique pesto flavours and combinations, basil pesto has always has a place in my heart. Let’s be clear – this isn’t a traditional basil pesto though. If you’re ever wondered how to make basil pesto, it’s pretty easy and reasonably priced if you use the ingredients I use. In fact, I’m just going to say it. Traditional basil pesto is insanely expensive to make thanks to the addition of pine nuts. A few years ago, I remember pine nuts selling on the supermarket shelves, but since then if you’re lucky enough to spot it, well, consider yourself lucky. It’s probably the most expensive nut in the smallest quantity, and I don’t want to do that to you. If you’re a stickler for tradition, feel free to use pine nuts for your nut of choice. 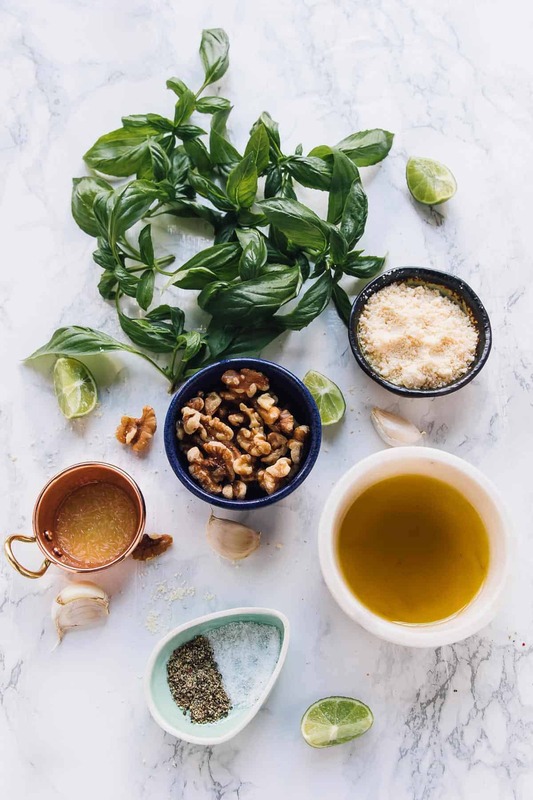 If you’re like me, then walnuts work just as well, and add a delicious nutty texture to the pesto. On top of that there’s the basil, vegan parmesan cheese, garlic, salt and pepper, and of course the olive oil. I love adding in a splash of lime to bring out all the flavours and keep the pesto bright and delicious. All in all, this pesto is AMAZING. Pesto is one of those sauces that is just so versatile, you’ll be using it every single day. I love the basics – pesto pasta and sandwich spread. I also love pesto crusted sweet potatoes (one of my favourite ways to eat it) and in every single breakfast. 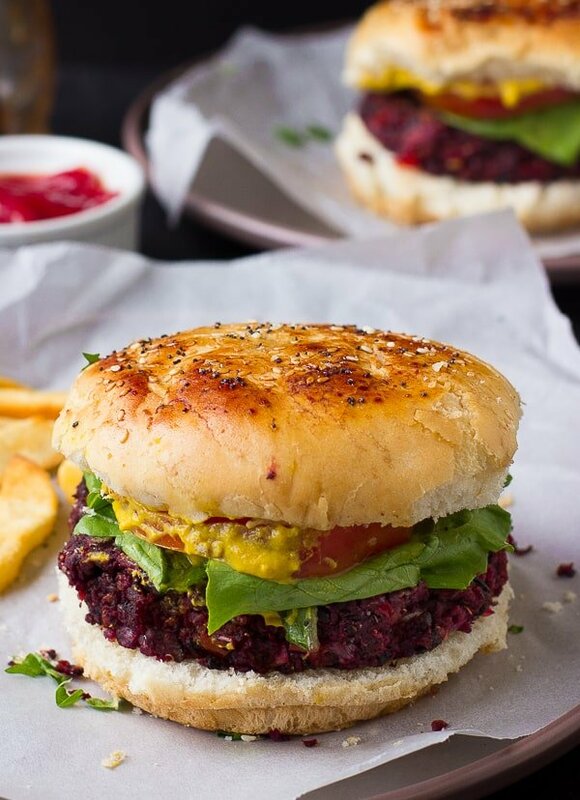 It adds a new dimension of flavour to everything it’s added to and is totally worth trying out. P.S. 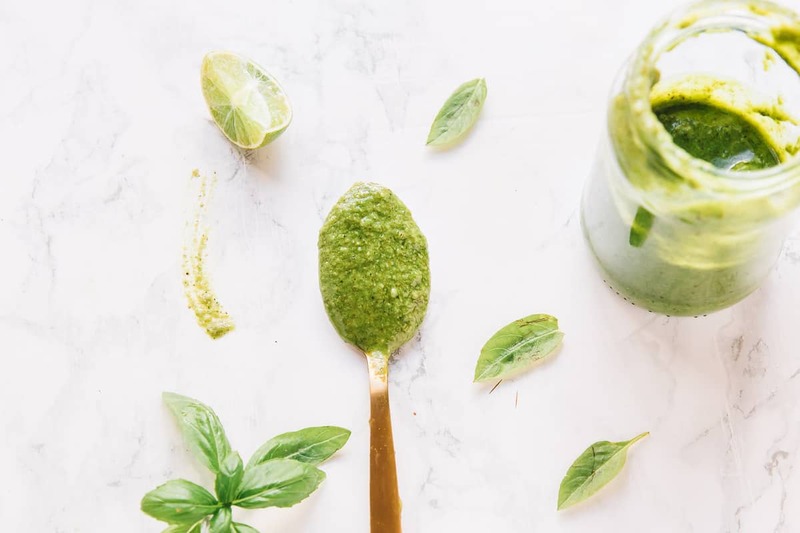 if you didn’t know – you can keep your pesto BRIGHT green for longer. 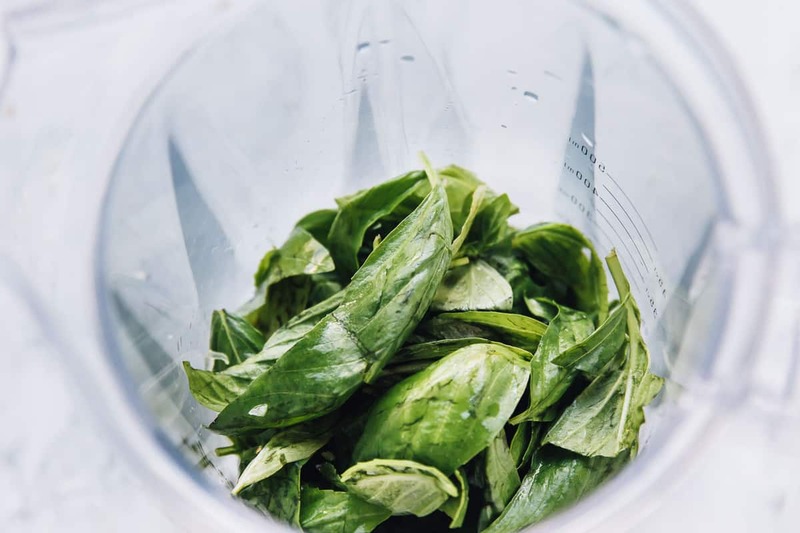 Just like with other greens, you need to blanch the basil – bring a pot to boil, dunk it for a few seconds until it turns bright green, then ice bath shock it and dry it. Then add it your pesto. Personally, this is more if you’ll be serving it at a party, or giving it as a gift, but it adds a stunning colour to it. Bonus points if you use roasted garlic – which will make this pesto even better. Q: Can I freeze this basil pesto? A: Yes – pesto freezes beautifully! You can freeze basil by storing in a ice cube tray, freezing it until solid, and then popping it out and storing it into a freezer safe zipped bag. To use again, just allow to thaw. Q: How much pesto should I use in my pasta/on my potatoes/any other use? 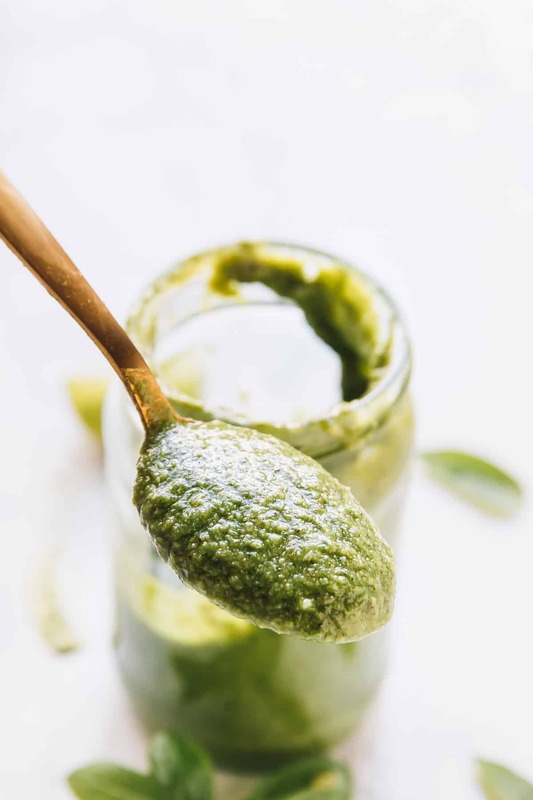 A: Pesto, although pourable, is a concentrated sauce. As such a little goes a long way, and you’ll want to use it that way too. I always start with a little – as an example, about 3 -4 tablespoons in this zucchini noodles recipe that serves two people. From there you can add more as you like without over saturating the dish. Q: How else can I use this pesto? A: My ultimate favourite way to use pesto is on a pesto pizza! 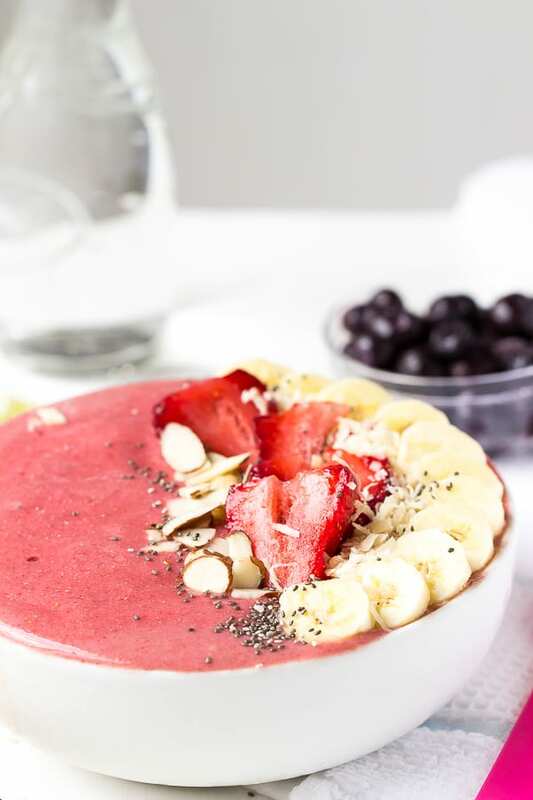 Add all the ingredients into a food processor or high powered blender and press the sauce/spread button or blend until combined smoothly, scraping down sides if necessary. 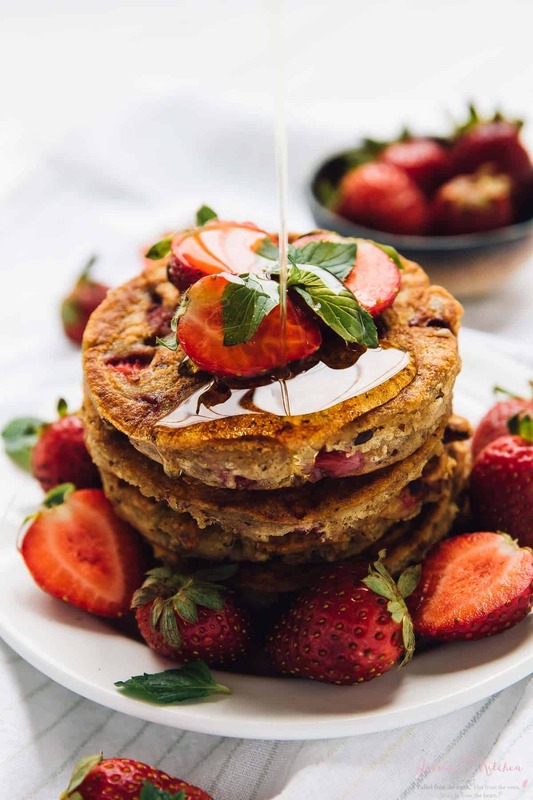 Pour into a jar and enjoy! If you try this Easy 10-Minute Basil Pesto Recipe please let me know in the comment section below, or tag me on instagram with the hashtag #jessicainthekitchen! For more exclusive recipes follow me on Instagram AND on Snapchat: jessinkitchen. What is that vegan Parm? Is it something artificial or made from nuts? The sauce looks pretty good. I love your recipes! I’m guessing that to make this pesto just substitute basil for the parsley? Thanks! Also thanks so much very much! I hope you enjoy!